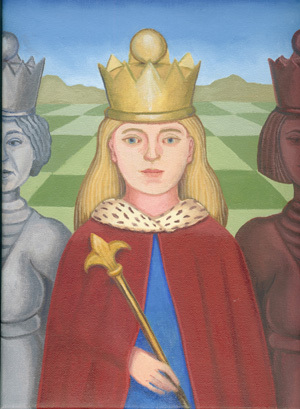 Queen Alice, © 2006, oil on canvas, 12x9 in. "Queen Alice," © 2006, oil on canvas, 12x9 in. Everything was happening so oddly that she didn't feel a bit surprised at finding the Red Queen and the White Queen sitting close to her, one on each side...."-- from "Through the Looking-Glass," by Lewis Carroll.